And then there were four. The race for the 2018 All-Ireland senior hurling championship has been whittled down to champions Galway, Munster kingpins Cork, Clare and Limerick. Three from the south are aiming to end Galway’s reign as Liam MacCarthy Cup holders but while all of counties remaining will fancy their chances, the Westerners are my tip to retain it. Ahead of the two semi-finals, today I run the rule over the quartet chasing the biggest prize in hurling, assessing their strengths and weaknesses, and pinpointing the key man for each. I’m also delivering a verdict for each county and when the dust settles, my prediction is that Galway will be celebrating back-to-back titles for the first time since 1987/’88. The final opponents will be Limerick, who are best equipped to scupper Galway’s hopes, with Cork and Clare left to reflect on semi-final defeats. Strengths: Their physical prowess and ability to mix up the long and the short games, as we saw against Kilkenny in the Leinster final draw and replay. Of the four teams left, they’re one of just two (along with Clare) who know what it takes to get over the line and win an All-Ireland title, plus they’re free from the baggage of chasing their first Liam MacCarthy Cup in almost 30 years. It’s easier to chase something you already have rather than obsessing over what you haven’t had for so long. They’ve an excellent bench to call upon with Jason Flynn, Conor Cooney, Seán Loftus and Thomas Monaghan waiting in the wings, to name but a few. They play a similar style and system to the Kilkenny teams of the late noughties, with a deep-lying half-forward line and midfield, and the movement of their forwards is top-notch. 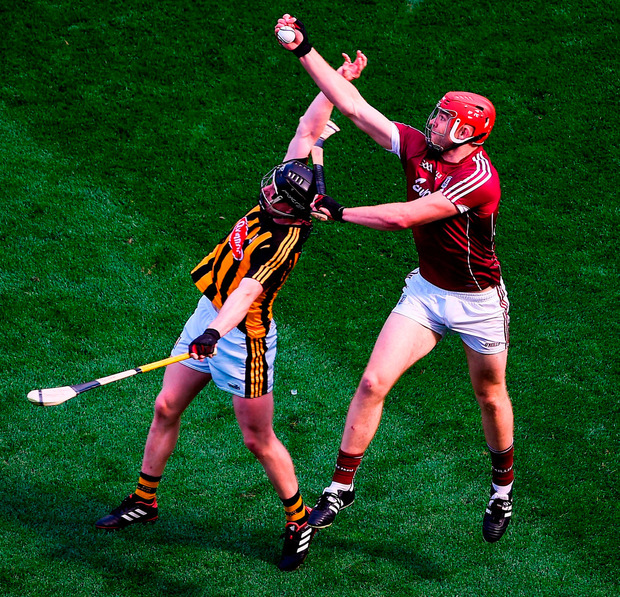 If they’re not weaving pretty patterns, they also have that route-one option in Johnny Glynn on the edge of the square and, as we saw against Wexford and Kilkenny, he’s a huge asset and a nightmare for the opposition to deal with. Weaknesses: I’m struggling to find one because this is the complete hurling package. They have tightened up at the back and while the changing of goalkeeper from Colm Callanan to James Skehill might have been viewed as an area of concern, Skehill has acquitted himself well to date. Key player: Pádraic Mannion. Mr Consistency and Galway’s best player of the championship to date. He sets up a lot of attacks and is also the man to put out a defensive fire when called upon. Prediction: All-Ireland champions. Strengths: Character, resilience and togetherness. This is a tight-knit bunch, as manager John Kiely has alluded to, and there’s a different feel to this Limerick team. There’s a real spirit in this bunch and their combined qualities have helped them to win tight games in this championship. There’s a never-say-die attitude in Limerick and they’ll keep going until the end. From here on in, games will be tight and Limerick will be calling on these traits again. In terms of physicality, they’re the next best thing to Galway, they play to a system and the players are following it to a tee. They’ve racked up some massive scores and, like Galway, there’s a bench to call upon. Many of their players have won All-Ireland U21 medals and they’re unburdened by the weight of history, and carrying no psychological baggage. I referenced their strength from 1 to 9 before their victory over Tipp in Munster; it’s a settled unit and the launchpad for any team. Weaknesses: For the majority of these lads, Croke Park and the business end of the All-Ireland senior championship is uncharted territory. They’re heading into the unknown and not much can prepare you for that. They’ll either sink or swim at GAA HQ and while their full-back line looks solid, they may need a positional switch to cope with a big man on the edge of the square. Limerick struggled with Clare’s John Conlon in Munster and Seamus Harnedy could cause them similar problems in an All-Ireland semi-final. It may be a case of asking Richie English and Mike Casey to swap, with Casey shuffling across to corner back. How they deal with the hype is another key factor. They didn’t deal with it too well before playing Clare in Munster and it didn’t happen for them either in 2013 when they lost an All-Ireland semi-final to Clare after claiming the provincial title. After beating Kilkenny in the championship for the first time in 45 years, a county is excited again and Kiely needs to shield his players from the hype. Key man: Declan Hannon. At 25, he’s nearly the elder statesman in this young team, and has 2013 and 2014 All-Ireland semi-final experience to call upon. If he can lead with a big performance, or performances, the rest will follow. Verdict: Beaten All-Ireland finalists. Strengths: Their forward division and pace from numbers 8 to 15. From an attacking viewpoint, Cork are as good as anything out there and they have go-to leaders in Patrick Horgan and Seamus Harnedy, who step up to the plate in pressure-cooker situations. Both have been showing phenomenal leadership and the return to fitness of Alan Cadogan will provide John Meyler with another huge forward option. Anthony Nash’s puck-outs are well-documented and have a massive influence on how Cork play. It also messes with opposition heads as they try to figure out a way to counteract them. Cork are very fit and finishing strong in every game. They appeared to be the only team in Munster capable of coping with that three-game spin during the round-robin series and that tells me something about the strength of their mental resolve. Meyler’s men are showing real battling qualities this year and when questions have been asked, they’ve answered them. That’s in contrast to previous years and while they do have huge qualities, I’m still not totally convinced. Still, I’ve been wrong about Cork before and possibly a little unkind to them. It will probably take them pushing on to win an All-Ireland title before I’m fully on board. Weaknesses: Similar to Clare, they’re super going forward but there are areas at the back where they can be got at. Past Croke Park defeats may play on their minds too and if the opposition snuff out Nash’s puck-outs and get a handle on Seamus Harnedy, do they have the ability to win hard ball? I also wonder if Meyler is sure about the make-up of his back six? They were exposed by Clare’s John Conlon in the Munster final, while Limerick’s Seamus Flanagan wreaked havoc in the drawn game at Páirc Uí Chaoimh. Mark Ellis is a defensive option coming back from injury and it will be interesting to see what Meyler comes up with. Key man: Seamus Harnedy. What a year this guy is having. He’s key to Cork’s aerial game and the go-to guy when the chips are down. We saw this in the Munster final when he showed incredible leadership before half-time and throughout the second half. Verdict: Beaten All-Ireland semi-finalists. Strengths: Firepower. Clare have the personnel on a given day to beat any team in the country. They have a target man inside in John Conlon, who’s in scintillating form, and that attacking unit has lots of pace and will relish the wide-open spaces of Croke Park. Many of these players have All-Ireland medals in their back pockets and they’ll love the chance to emulate the great Clare teams of 1995 and 1997, who won the Liam MacCarthy Cup twice. Clare also have good options off the bench in Conor McGrath, Ian Galvin, David Fitzgerald and Jason McCarthy. Their short game can trouble any of the teams left in the race and this may be the key to breaking down Galway. The return to top form of Podge Collins and Shane O’Donnell couldn’t have come at a better time and the emergence of Peter Duggan is another major plus. Granted, he missed a couple of crucial frees in the Munster final but he’s generally good on placed balls and a massive aerial presence up front. Weaknesses: For all of that aforementioned firepower, Clare are shipping big scores at the other end of the pitch. They’re presenting far too many scoring opportunities to their opponents and that’s a concern. Question marks still hang over that full-back line and Clare can switch off at crucial periods, as we saw in the Munster final. They allowed Cork the scent of a comeback before half-time and the Rebels didn’t need a second invitation. Clare were a far superior team to Wexford last weekend but just three points separated the sides when it should have been well closed out. On the plus side, Clare did show some resolve and character when the pressure came on to finish it out. It’s going to be a massive ask for Clare to go and take down Galway but they do have the game to trouble them. I just worry for them at the back and I don’t see them having enough to hold out. Key man: Tony Kelly. He’s the man who makes Clare tick and if he can perform at Croke Park like he did in 2013, anything is possible. Prediction: Beaten All-Ireland semi-finalists. Brendan Cummins If we were looking for an insight into the mindset of this Limerick hurling team, we got it shortly after their quarter-final win over Kilkenny last weekend.